Part of Thursday morning’s kayak flotilla. Contributed. KJIPUKTUK (Halifax) – Following a well-attended rally in Halifax on Tuesday this week, the Campaign to Protect Offshore Nova Scotia (CPONS) hosted a packed house for a public panel in Mahone Bay on Wednesday night. 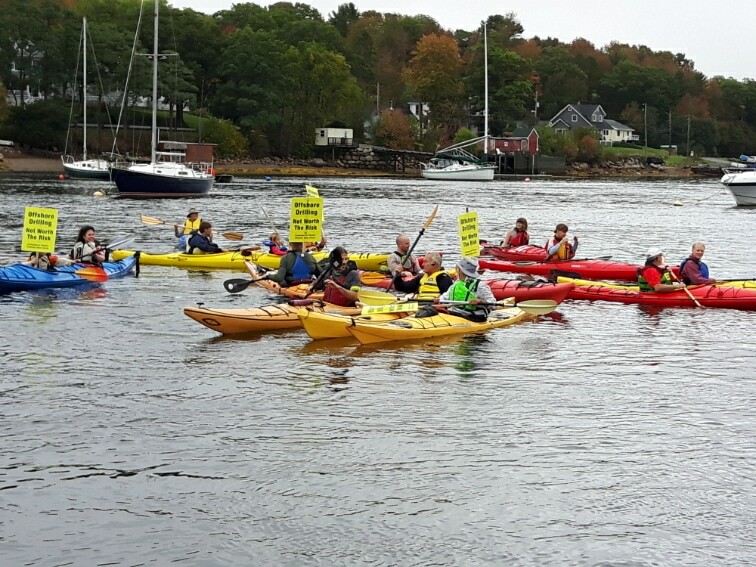 Protesters, signs in hand, also formed a kayak flotilla in Mahone Bay on Thursday morning. Concerns around BP’s offshore presence include the lack of public consultation and BP’s failure to prepare for an eventual spill, especially the lack of a nearby capping stack, given the potential large scale damage of such a disaster to the environment and the province’s fisheries and tourism industries. People remember all too well that BP was responsible for the 2010 Deepwater Horizon catastrophe, which claimed the lives of 11 workers and ravaged the Gulf of Mexico and its shoreline with almost 5 million barrels of spilled oil. Oil spewed for almost 90 days, partly due to there being no capping stack nearby. More locally, BP has already had a significant accident on the Scotian Shelf: 136,000 litres of toxic drilling mud were spilled back in June. The public panel served as a reminder of how both the past and future must be considered as efforts are made to establish a moratorium on offshore drilling in Nova Scotia, at least for the present. Mi’kmaw artist Melissa Labrador reminded the audience treaties are not just about sharing Mi’kma’ki, but also about protecting it. Labrador’s young daughter, Nakuset, then drummed and sang a song, stating that we must act today in order to limit the impacts of human destructiveness on future generations. Maude Barlow, of the Council of Canadians, spoke at length about the capping stack problem. In the event of an “incident,” the stack—the fix—would need to be brought to the Scotian Shelf from Norway, a two-week trip. Not many countries would tolerate such a delay, she said. Barlow also spoke of how the Canada-Nova Scotia Offshore Petroleum Board (CNSOPB) is a case of industry players regulating their own industry. We need a public inquiry into the offshore drilling approval process, Barlow said, and we need to move towards energy alternatives, rather than building up infrastructure to support oil extraction: “Stop the growth and start the transition now. Enough is enough. We don’t want to get locked into a fossil fuel future,” she said. CPONS spokesperson Chelsea Fougere tied the issue to a critique of capitalism, describing the risky offshore drilling venture as a case of rural livelihoods being put at risk for the sake of profits for the already ultra-rich. The acceptance of risk with little or no public consultation shows how the regulatory boards are the face of capitalism, not a component of our democracy, said Fougere. The handful of mostly-temporary jobs and oil royalties are nothing to Nova Scotia’s economy when compared to jobs sustained by fisheries and tourism industries. Previous Post Danny Cavanagh: Don’t let the P3 snow blind you!